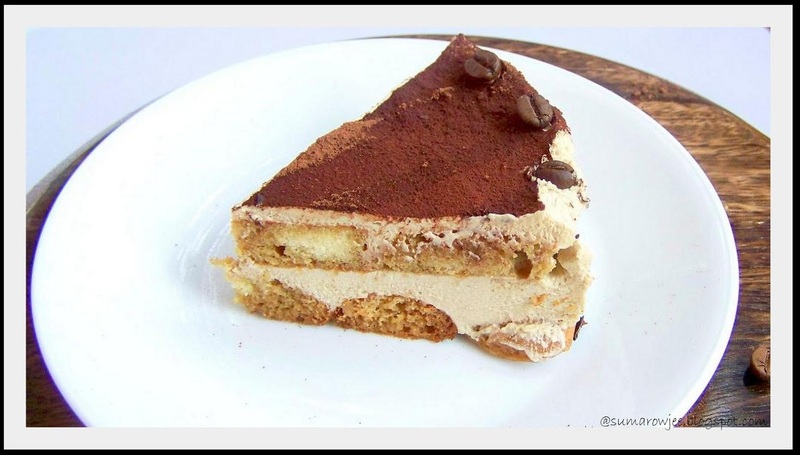 Cakes & More: Classic Tiramisu - For 3 Years Of Blogging! And we turn 3! Time sure does fly! Wasn't it just recently that I celebrated Cakes And More turning one with Dorie Greenspan's Tiramisu cake? Being the coffee lover that I am, the coffee mascarpone filling sure wasn't going to be forgotten in a hurry...meaning more Tiramisu in my kitchen! The famous Italian dessert Tiramisu (pronounced 'tih-ruh-mee-soo'') literally means 'pick me up' (metaphorically, 'make me happy') - Wikipedia. Dorie's Tiramisu cake is a modern take on the old classic, the classic one being made in a different way altogether. Most versions of the classic recipe have ladyfingers or savoiardi, zabaglione, pastry cream, mascarpone, whipped cream and coffee liquor /coffee /marsala/ rum for dipping as the components. The zabaglione, pastry cream, mascarpone and whipped cream are mixed together, the ladyfingers are dipped in a coffee or marsala laced syrup. The soaked fingers and the cream are layered in a dish and chilled to set the dessert and allow the flavors to mature as well. Yes, quite some amount of time and effort, but then I had to make it at least once - just for the fun and high of putting together a dessert with so many components - all made from scratch! This was the recipe for Tiramisu for a DB challenge hosted by Aparna and Deeba. Original recipe from Baltimore pastry chef Carminantonio from The Washington Post. Here are the components and the recipe. Planning ahead is important for this dessert. You would need to make all the components, assemble them and then allow the flavors about a day or more (if you ask me) to mature in the fridge. Ladyfingers: I have used the recipe from Joy Of Baking, my post here, worked well for me in terms of the texture. (Now you know, why I chose to make ladyfingers for the DB challenge). Plan ahead and bake these maybe a week or two before you make Tiramisu and freeze them (or refrigerate if making just a day or two ahead). Trust me, you will be so glad you don't have to make these along with the rest of the components! The zabaglione /sabayon: An Italian custard, sometimes made with raw yolks. A lighter textured, frothy version is often served spooned over berries. This recipe thankfully has no uncooked eggs in it. The yield was a scant 1/2 cup of zabaglione. Heat water in a double boiler. If you don’t have a double boiler, place a pot(with a wide stable base or it will keep threatening to fall off the stove as u whisk away) with about an inch of water in it on the stove. Place a heat-proof bowl (I used steel) in the pot making sure the bottom does not touch the water. In a large mixing bowl (or stainless steel mixing bowl), mix together the egg yolks, sugar, the Marsala (or espresso/ coffee), vanilla extract and lemon zest. Whisk together until the yolks are fully blended and the mixture looks smooth. Transfer the mixture to the top of a double boiler or place your bowl over the pan/ pot with simmering water. Cook the egg mixture over low heat, whisking constantly,(do not stop unless you don't mind scrambled bits of egg) for about 8 minutes or until it resembles thick custard. It may bubble a bit as it reaches that consistency. Let cool to room temperature and transfer the zabaglione to a bowl. (I strained it to make doubly sure there weren't any bits of egg) Cover and refrigerate at least 4 hours or overnight, until thoroughly chilled. This tasted very sweet and strongly flavored with coffee, but it was fine when added to the rest of the things, so that was fine. For the vanilla pastry cream: Basically egg based custard with cornstarch added to it. This recipe uses only one egg yolk and only a tablespoon of cornstarch which was good for me! Mascarpone:Recipe here. The recipe here calls for 75 grams of mascarpone. I tried making a small portion of mascarpone with lesser cream but it did not work all that well (too little cream to heat up well enough?). So I would suggest you make the entire quantity and reserve the remaining mascarpone for another use. Chill the cream atleast 8 hours. Chill the bowl and beaters for at least 15 minutes. Place the chilled bowl with the cream and vanilla in it over a larger bowl filled with ice. Beat first on low and then move to medium high speed and whip till soft peaks form. Unsweetened cocoa powder - 2 tablespoons/30gms or a bit more as needed. Now to start assembling the tiramisu.Working quickly, dip12 of the ladyfingers in the sweetened espresso, about 1 second per side. They should be moist but not soggy. (I over did I guess, but it was still perfect, not soggy!) As you dip each ladyfinger, immediately transfer each one to the platter, placing them side by side in a single row. You may break a lady finger into two, if necessary, to ensure the base of your dish is completely covered. I have made 2 layers of ladyfingers and 2 of cream. i.e. ladyfingers at the bottom and cream on the top layer. (Original recipe says Spoon one-third of the cream mixture on top of the ladyfingers, then use a rubber spatula or spreading knife to cover the top evenly, all the way to the edges. Repeat to create 2 more layers, using 12 ladyfingers and the cream mixture for each layer). Clean any spilled cream mixture; cover carefully with plastic wrap and refrigerate the tiramisu overnight. I liked the taste and texture best after about more than a day and half in the fridge. Dust the top generously with cocoa, decorate with coffee beans and chocolate curls. If you leave the cocoa dusted dessert in the fridge, it will turn a beautiful darker color gradually. Be sure to keep the Tiramisu covered airtight - a cake caddy works best. Cut into wedges and serve. Save some to eat the next day too! Whew! So I made the real Tiramisu for the high of making it. It was indeed good, a lovely treat for coffee lovers. Moist, but not in the least soggy coffee flavored ladyfingers and coffee mascarpone can't really taste anything but good together! Given the amount of effort and time for this, I may not make it again very soon, but may be I will cheat next time, make a easier version with ladyfingers and Dorie's coffee mascarpone cream? I would like to take this opportunity to thank you all for being a source of inspiration for me via your mails and comments, thanks so much for being part of my blogging journey. Its been an eminently enjoyable and gratifying one! Awesome pictures and I am drooling at the Tiramisu slice..haven't felt courageous as yet to make the real thing:)Love Dorie's cake version though,have made it quite a few times already.Love the cake stand,looking apt with the Tiramisu.And yes,congratulations for completing 3 years of blogging,wish you many more! This looks DELICIOUS. 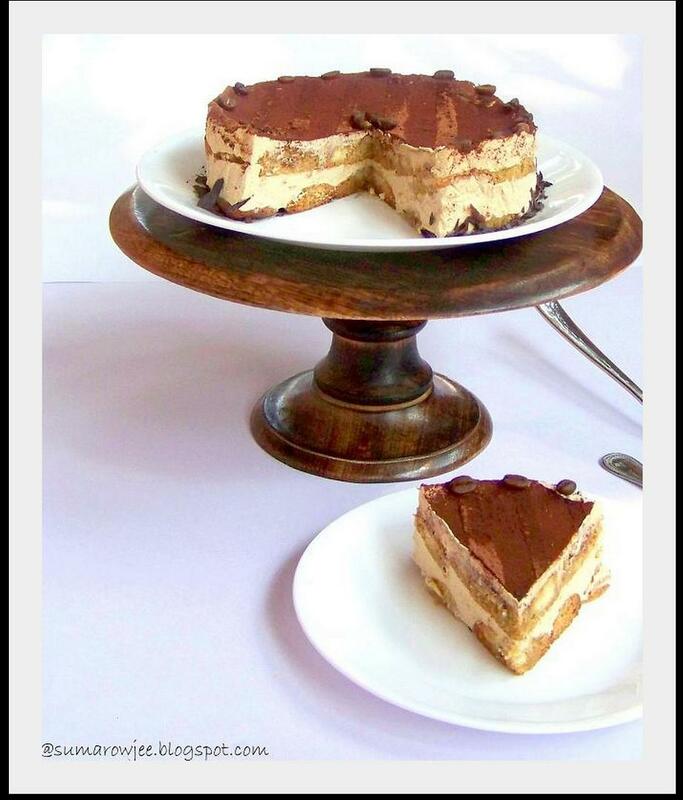 I loved the tiramisu when I made it for the DB challenge, and this post has me wanting to make it again. Happy Blogiversary! Wow looks absolutely perfect...Wishing you many more such achieving yrs!! Congrats Congrats on your Milestone !!!!! Keep rocking !!! Now I can see heaven on the plate !!!! What a wonderful dessert to celebrate blog b'day ...Way toooooooo tempted. Keep going !!! Congratulations on 3 years of blogging, Suma. As for the tiramisu, WOW!!! What an awesome looking Tiramisu that is ! Congratulations on 3 years of blogging and coming up with such fabulous recipes ! Such a beautiful tiramisu, heaven in the plate..Happy bloganniversary suma. Happy Blog-anniversary Suma. 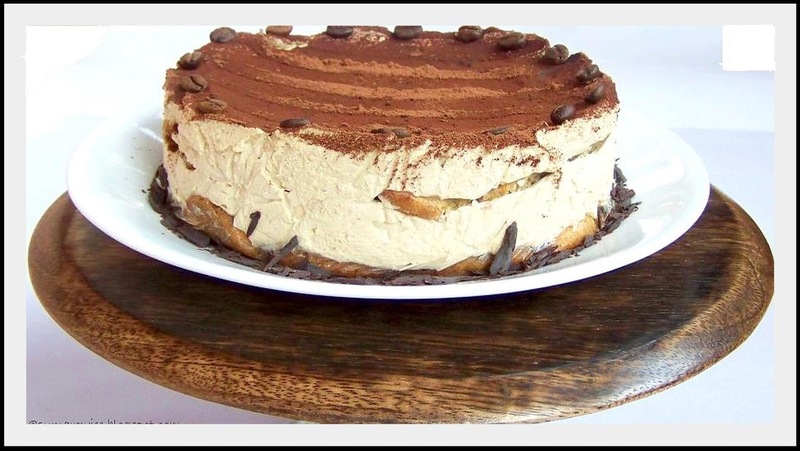 Loved the Tiramisu cake..hope I can try it someday!! Congrats! keep blogging and enjoy. The cake looks good. i have not yet gathered the courage to try a tiramisu.. have to try it soon! isnt this that summer house cake stand? this looks so tasty..... one of my favourite desserts with coffee & a touch of cocoa! Now there you tempt me again with this beautiful post with tempting pictures! So, I'd like to try again with your home-made mascarpone. Thanks for sharing, sums. Many more years of happy blogging! I am drooling over this Tiramisu made from scratch! How many hours did it take from start to finish? Delicious! Congrats on completing 3 years of successful blogging! Congrats on turning 3. Wish you more milestones. Congrats dear.... keep on going. Grissini - And The Winner Of The Giveaway!